BANDI Wear's belts look like something you’d wear even if you didn’t need to carry things. It combines the convenience of a fanny pack with a more streamlined, subtle appearance. Founders Bev Perrea and Beth Koenig spent a year and a half developing this flattering, modern fanny pack. BANDI folds over on itself to form a low profile pocket, without the bulk of zippers or snaps. Tuck a cell phone, ID, and cash inside the generous interior. (The larger BANDI even fits a passport.) For keys or coins, a smaller side pocket is just right. The soft spandex knit is comfy with an adjustable glide for a fast, snug fit. Whether you’re running errands, or actually running or exercising, BANDI is made to stay put. Wear BANDI under your clothes or over. Use it a security belt while traveling, and even keep it on through a metal detector (as long as you aren’t carrying keys!). With a variety of colors and patterns to choose from, BANDI complements your outfit and your lifestyle. Hi everyone! I'm Bev, the founder of BANDI Wear. Our bands are the stylish way to secure life's essentials while giving you the freedom to explore your next adventure. Stash your stuff, not your style! I'd be happy to answer any questions you have. Hey Bev..........video says it will fit a iphone. Will it accommodate a Samsung Galaxy that is a little bigger? Thanks. Hi Carol Lee - our Classic Pocket Belt fits phones up through the size of the new iPhone6. 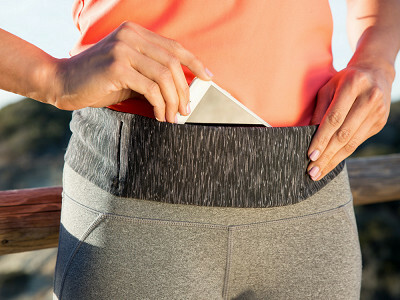 Our Large Pocket Belt fits the iPhone 6 Plus and also the Galaxy Note, both large size phones. Is your Galaxy phone the Note model? If so, you will need the Large Pocket Belt. I think it is a wonderful idea. However it is too pricey. I would love to get one for a friend of mine who still uses the dated fanny pack. Yikes! Hi Mickie - we do our very best to keep BANDI products affordable. The U.S. factory that sews for us provides outstanding quality and we work very hard to find the best prices on our fabrics and materials. One nice feature is that our belts have multiple uses for travel, exercies and everyday wear; since they are both sleek and stylish. Thank you for sharing your concern and for liking our belts! Do you plan to offer the large size in other colors? Hi Janet - thanks so much for appreciating the goal we had and achieved, to manufacture BANDI in the U.S. Thank you for making them here at home! Thanks very much for the support, Katherine! Still trying to figure out the sizing, how large a waist? why is the large only in solid black? Our belts are adjustable (there is a slide) and the fabric also has lycra for stretch. When the belt is cinched to the smallest size it fits down to approxiately 27". When the belt is fully extended it fits up to 40"-42". The belts are typically worn below the waist, on the high hip. We started with the Large Pocket Belt in only Solid Black because it is a new item, but hope to expand our offering on The Grommet in the very near future. How does it do with a corded earbud - does the wire coming from the iphone create a problem? Hi Ginnie - our belts work great with earbuds. Position your phone so the earbud cord is on top, then the cord simply feeds up through the top of the pocket opening and over the pocket fold. This would be great for my daughter who is a runner! Would the new iPhone 6 fit in the small one or should I order the larger one? Also, is there a projected date for the larger one in colors? Hi Lee Ann - Our Classic Pocket Belt (the smaller pocket) is a perfect fit for the new iPhone 6! You do not need the Large Pocket Belt for the iPhone 6. There is not yet a projected date for a larger assortment in the Large Pocket Belt. We are reviewing that with The Grommet. I am sure The Gromet will let their followers know just as soon as they have that information! would this fit an Epi-Pen? Hi Kathryn - that is a great question. Yes, our Classic Pocket Belt is a great way to carry an Epi-Pen. We know from speaking to customers that it is often used for Epi-Pens, as well as for carrying other small medical devices, such as insulin pumps. Joanne from The Grommet here. I wanted to clarify that Bandi is a one-size, fits-all adjustable belt. The Classic Pocket version adjusts to accommodate hip measurements from 28 inches to 42 inches. 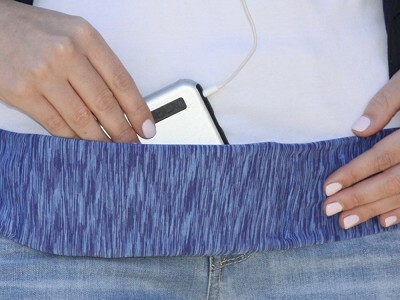 The large belt is the same size but it has a bigger pocket to accommodate larger phones and more of your stuff. We are now working on adding the available, additional colors in the larger pocket version. Hip Hip Hooray…made in America. This is going on my wish list but will not be there long I guarantee. Good Bye Fanny Pack. This might work for my husband. He wears an insulin pump and it does not stay in his PJ pockets and he is a side sleeper. Several times it has stopped working because of supply line kinking. He could put pump in pocket and secure to his stomach area. Just an idea for others.. PamK. @Pam Last week we introduced BANDI at the TypeOneNation Summit in Cincinnati and the response was overwhelmingly positive! BANDI is a great solution for your husband's pump. Thank you for mentioning this very useful application for our product. It's a great way to discreetly wear a pump either over or under clothing. Would totally buy it in any hue of purple, solid or print! When would that become available?? Hi Anne, fuschia is technically a hue of purple. Certainly on the lighter side but it qualifies! Is this secure enough to hold items while you are ziplining? Hi T, I'll let Bev tell me if I'm off base, but since there isn't a lot of intense body movement when zip-lining, it should work just fine. Though you might want to take extra precautions with your valuables due to the extraordinary height. Also, be sure to Instagram a picture of you zip-lining wearing one and tag @TheGrommet and @Bandiwear in it! I'm a large woman (size 3x-4x, depending on the product and cut). Will these fit larger people? @Bev, never mind. I see the answer above. But I do wish it was available in larger sizes. There are many of us who are trying to slim down, but walking or exercising with a regular fanny pack gets uncomfortable and irritating. This sounds like something that would allow a person to put an mp3 player in it to listen to while walking/working out.